Breakfast cereals are a battleground in my family. Faced with supermarket shelves groaning with boxes of cereal, my children focus unswervingly on anything stuffed with sugar, covered in cartoons or promising toys, and ideally all three. When did chocolate become a breakfast thing anyway? Cocopops, Cookie Crisp, Nesquik Chocolate Cereal, Krave, they’re all at it. Now you can even buy Weetabix with chocolate, damn it. I get to play the part of mean mummy, ranting on about sugar content and sneaking in cheaper own-brand or value versions. I try to steer my children in the direction of healthier alternatives like porridge, rice krispies, weetabix and shredded wheat, even though I appreciate shredded wheat is the rough equivalent of eating a bowl of thatched roof with milk on it. They are prepared to eat porridge sometimes – provided it’s doused in golden syrup, sigh. Anyway, last month we’d bought an unusually large range of cereals, suckered in by a Kellogg’s offer including free tickets to Legoland. Spurred on by a particularly irritating Krave advert (cereal spawn of Pepperami, I reckon), I actually had a look at the labels. I got my daughter to help order the boxes based on their sugar content, because yes it’s all fun in the mornings round here, and was surprised at the results. Sure, I’d guessed that the porridge oats and Sainsburys Basics Breakfast Wholewheat Biscuits hiding on the left might have the lowest sugar content. Plus I wasn’t under any illusions that my husband’s favourite honey nut cornflakes on the far right might be high in sugar, given the give-away honey reference. But wow, 36.3g per 100g? That’s more than a third of the box. I was actively surprised that Fruit & Fibre had the second highest sugar content, even more than the Rice Krispy Multigrain Shapes bought under pester power. It’s got fruit, it’s got fibre, it sounds so healthy? Turns out it packs out a quarter of the box with sugar: 24g per 100g cereal. No wonder my daughter is prepared to eat it. 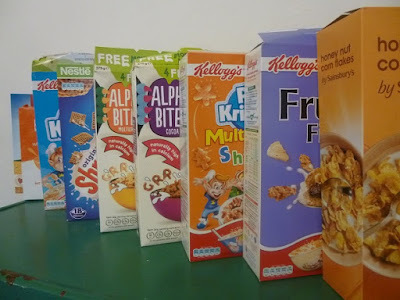 I was also quite surprised that the worthy Bear Alpha Bites cereals, bought for their oh-so-educational letter shapes and fridge magnets, have pretty much the same sugar content as Shreddies, all around 15g of sugar per 100g cereal. Still not sure how my children will chow down Shreddies as a snack, but prove resistant to the “monstrously healthy” Alpha Bites, when they should have the same sweetness. Once these boxes ran out, we rang the changes with some different options. I stuck with the porridge and Basics version of Weetabix, but bought ordinary cornflakes instead of the honey nut version, which slashed the sugar content from 36.3g to 7.2g per 100g. Turns out some supermarket own brand cereals have less sugar than the branded alternatives, so for example Sainsbury’s Wholegrain Fruit & Fibre has 15% less sugar than the Kellogg’s version, still high at 20.4g but less than 24g per 100g. Doesn’t always work though: Sainsbury’s Wholegrain Malties have 16g sugar / 100g, very slightly more than Nestle Shreddies’ 15g. (And my daughter still snuck Nestle Cheerios into the trolley, with 20.9g sugar /100g. At least they were on offer at half price). Maybe the moral of the tale is just that I shouldn’t take my children shopping. Terrible isn't it. Could try not having them shopping, if so, get rid of the outside boxes so they don't know what brand they are eating. And this is why we rarely have cereals in the house. Currently just a box of a supermarkets own fruity shreddie type things for my Lovely Hubby for when his sweet tooth comes a calling. Usually breakfast for me is a Nutriblast or yoghurt and banana, my LH will have either the cereal or home made muesli or toast. Weekend breakfasts are nearly always egg based with bacon thrown in for LH, I don't eat meat. But of course we have the HUGE advantage of grown up children who no doubt stock their own cupboards with sugary cereal but can't pester us to do the same. When they come to visit they get bacon butties for breakfast which they love. Now I really fancy a bacon sandwich! I do the mean mummy thing over breakfast cereal – Weetabix (supermarket own) or porridge. Cornflakes are a weekend treat! Yes, I am that mean. The percentages remain the same; for fat in food work on 25% and sugar/protein 20% as being the norm.